Oak wilt can be very expensive to control, but prevention is effective. For this reason, we recommend postponing timber harvests within or adjacent to valuable oak forests in the high-risk zone when oaks are most susceptible to infection (from April 1 through July 15 in the southern half of Minnesota, and April 15 through July 15 in the northern half of Minnesota). If the spring is unusually warm, the risk of oak wilt can occur before April. If the daily high temperature is about 60 degrees Fahrenheit or higher for six consecutive days, there may be a risk of oak wilt. 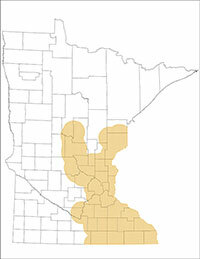 The pink area is the high-risk zone for oak wilt and shows the known range of oak wilt in Minnesota as of May 2018. Controlling oak wilt involves stopping both underground and above-ground spread of the disease. If done correctly, oak wilt can be successfully managed on a property-by-property basis throughout Minnesota, but control might not be appropriate in all circumstances. Since controlling oak wilt varies from site to site, work with an experienced professional to control oak wilt on your property. 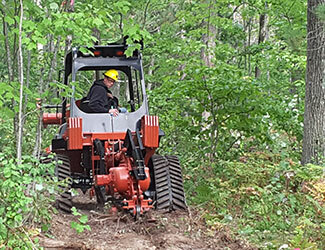 Cost-share for oak wilt control may be available on privately managed forest land through the DNR Cooperative Forest Management program and through the USDA Environmental Quality Incentives program. In woods with lots of oak wilt, controlling the disease might not be realistic. In those cases, it may be best to start over and restore the site. Oak wilt can spread to stump sprouts through root grafts, but the underground movement of oak wilt does not usually kill planted oak seedlings or those growing naturally from acorns. Plant a diversity of tree species to make the woods more resilient to oak wilt and other problems in the future. In flat oak forests with some oak wilt, we recommend three steps for control. You may want to work with a forester to combine disease control with improving your entire stand. To stop the underground movement of the disease, make a barrier line: cut root grafts around infected oaks, including a ring (buffer) of healthy oaks, between August and when the ground freezes. A vibratory plow is the best tool for this, since it disturbs the site the least. Bulldozers, excavators, and trenchers also can disrupt root grafts. The root graft cuts must be five feet deep for effective control. The buffer of healthy trees needs to be wider for bigger trees and on sandier soils. To understand how far oaks may graft to each other, see the root-grafting table in Oak wilt management - what are the options? Remove healthy oaks within the barrier line, since the likelihood of them dying from oak wilt in the next few years is high. This removal is called cutting to the line, and is illustrated below. Lastly, remove diseased oaks to stop the above-ground movement of the disease. It is crucial to remove diseased oaks only after root graft severing. Properly handle infected wood before April. The recommended sequence of steps from left to right for controlling oak wilt in flat oak forests. The yellow arrows (left image) show where a primary barrier line could be placed. 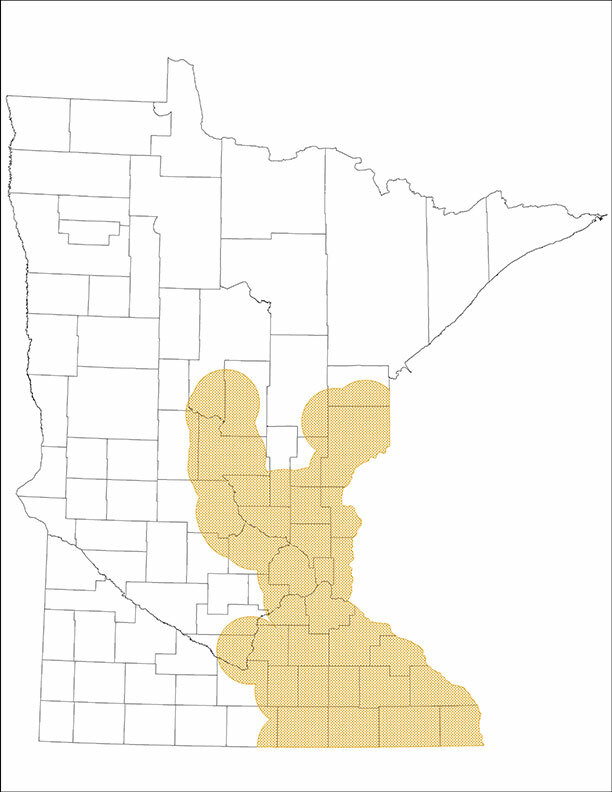 Adapted from illustration in Oak wilt in Minnesota. Cut down a buffering ring of healthy oaks around a mortality pocket from late summer through fall. On steep terrain, the buffer of healthy trees does not need to be as wide as a buffer on flat terrain. Apply an herbicide to the stumps soon after cutting to reduce the time that stumps and roots stay alive and sustain the disease. Use an herbicide labeled for cut-stump treatment and carefully follow label directions. Remove diseased oaks to stop the above-ground movement of the disease. It is crucial to first remove healthy buffer oaks, then remove the diseased oaks. Properly handle infected wood before April. If you cannot cut down a buffer of oaks and treat their stumps, then cutting down diseased oaks and properly handling their wood will still prevent oak wilt from starting in new areas. In this case, cut down diseased red oaks only after the ground is frozen, and properly handle the diseased wood before the next April. Cutting down the diseased oaks after the ground is frozen may delay the inevitable underground spread to neighboring oaks. Oak wilt can be very expensive to control, but prevention is effective. To prevent oak wilt, do not wound oaks from April through July, which is when oaks are most susceptible to infection. If hazardous branches or trees must be cut during this high-risk period, immediately apply water-based paint or shellac to the cuts (or the outer sapwood of a stump in the case of entire tree removal). Wounds may be susceptible to infection for up to five days. During an unusually warm spring, the risk of oak wilt can occur before April. If the daily high temperature is roughly 60 degrees Fahrenheit or higher for six consecutive days, oak wilt infection can happen. 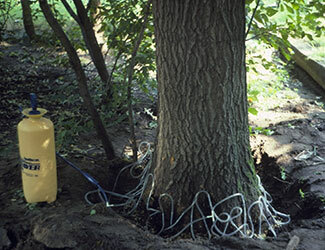 In yard settings where healthy oaks are extremely valuable to homeowners and nearby oaks have oak wilt, homeowners may consider hiring an experienced, professional arborist to inject their healthy red or bur oaks with a fungicide containing propiconazole. Injections do not prevent infections through root grafts, but they will sustain an oak as long as injections continue every other year. White oaks can be treated with propiconazole once they display early symptoms of oak wilt. Stop the underground movement of the disease by making a barrier line: cut roots around infected oaks, including a ring (buffer) of healthy oaks, between August and when the ground freezes. A vibratory plow is the best tool for this since it disturbs the site the least, but trenchers also can disrupt root grafts. The root graft cuts must be five feet deep for effective control. The buffer of healthy trees needs to be wider for bigger trees and on sandier soils, so to understand how far oaks graft to each other, see the root-grafting table in Oak wilt management - what are the options? Wait to see if the trees die. If they die, remove and destroy them before the following April. Keep them alive by injecting them with propiconazole every other year for several years (read more injection details under the Prevention section). Inject them before diseased oaks are cut down. Protect them with a second barrier line. These secondary barrier lines fail most of the time, so we do not recommend this option. Remove diseased oaks to stop the above-ground movement of the disease. It is crucial to first sever root grafts, then remove diseased oaks. Properly handle infected wood before April. If you cannot install a barrier line, then cutting down diseased oaks and properly handling their wood will still prevent oak wilt from starting in new areas. In this case, cut down diseased red oaks only after the ground is frozen, and properly handle the diseased wood before the next April. Cutting down the diseased oaks after the ground is frozen may delay the inevitable underground spread to neighboring oaks. Tarp wood by completely bury edges of the tarp in soil to prevent sap beetles. Cut down infected oaks before April. Make sure you cut the stumps as close to the ground as possible. Burn, debark, or chip logs and larger branches before April. You may burn fresh oak wood in an outdoor boiler if you mix it with dry wood. Chips and bark will not spread infection, so they can be left on site. Process diseased logs into lumber or kiln dry before April. Tarp wood from April through August. 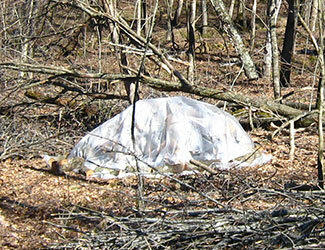 You must completely bury the edges of the tarp in soil to prevent sap beetles from coming into contact with spores. Also, the tarp should be thick enough to prevent punctures. Diseased oak logs and branches will only produce spores once, so oak trees or logs seasoned over one year from tree death will not be infectious.